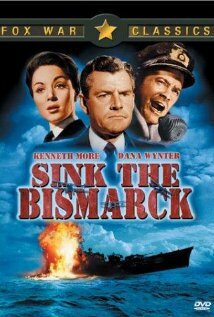 When Germany’s Bismarck sank Britain’s Hood in 1941, 1,415 men lost their lives; only three survived. The final explosion that sent Hood down is dramatized as one of many fantastic occurrences in this tense and realistic film. The image quality on this DVD is crystal clear black and white CinemaScope. The clarity of images is stunning if you are accustomed to older films looking worn and scratched. Images of Swordfish torpedo biplanes being launched from the deck of the aircraft carrier Ark Royal, for example, look as if they were filmed yesterday. Much of the screen time is devoted to a fictionalization of events in the Admiralty’s underground control center where the chase and battle are coordinated. People there lose all track of time as the hours and days are devoted to the pursuit. The exposition of tactics and intelligence is very well done. While oversimplified there is enough detail presented to allow the viewer to follow the action. Much of this must be attributed to the filmmakers’ realization that many of the participants were still alive at the time this film was made, so the margin for messing with the facts was small. While the extras on this DVD are few, they are good. One is a newsreel of the time which shows how well the movie has integrated real footage — and how well the physical settings have been re-created. Another is a series of war movie previews that provide the sound and flavor of how theatrical trailers were once produced.